We live in a digital world full of tech-savvy travelers — and enabling hotel technology that can help you reach them online. To survive and thrive as a hotelier, you’re going to want to get comfortable in this digital environment and keep up to date on the latest developments. 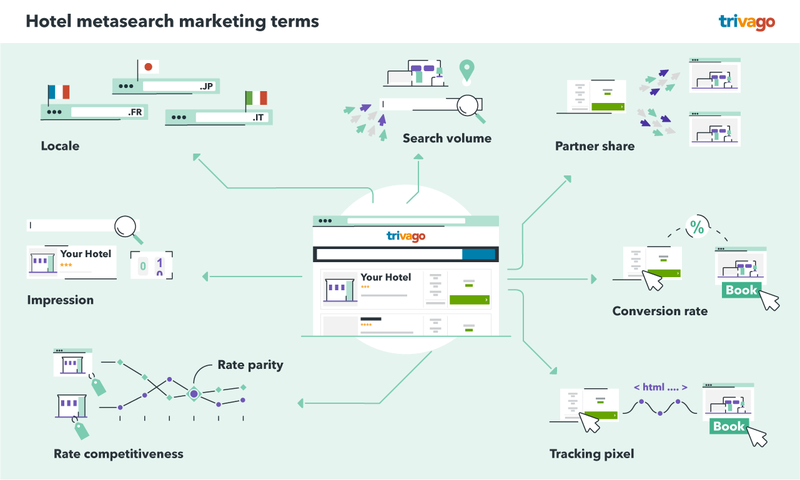 And what better way to keep your digital hotel marketing, distribution, and technology know-how razor sharp this year than with a visual online glossary of the must-know terms for hoteliers? Hotel metasearch: Your connection to a world of digital travelers. When marketing your property on trivago, whether by optimizing your hotel profile or promoting your direct website rates, you’re going to run into at least a few of these terms. Locale is a market that has its own domain on a hotel listing website, for example, trivago.fr, trivago.it, trivago.jp. Search volume reflects the number of online searches for something specific within a certain period of time (e.g. hotels during summer). Partner share is the percentage of clicks on a property’s hotel deals that went to the OTA advertising that deal. Conversion rate is the percentage of the total number of visitors who completed a desired goal. For example, a website has a booking conversion rate of 25%. That means 25% of the total visitors made a booking. Tracking pixel is an HTML code used to count the number of travelers’ clicks on a link to visit a website or complete a booking there. Rate parity is to ensure that hoteliers give the same rates for the same rooms on all booking channels they use. Rate competitiveness refers to how competitive your property’s direct rates are in comparison to your advertised rates on other booking channels. Impression refers to the time when your hotel listing is shown on a search result page. Although, this doesn’t mean that a traveler has clicked on the listing. The now-essential digital tools for every hotel — Do you have them all? When you’re looking to run a modern and efficient hotel business and to distribute your inventory online, these are the core pieces of tech you’ll be needing. Property management system (PMS) is a software that helps hotels manage their operational functions, such as bookings, front office, and financial reporting. Channel manager is a software that automates the distribution of rates and inventory to various booking channels. This makes it easier to manage rooms from one centralized place and avoid overbookings. Your website is the shop window of your business and where travelers can book rooms directly with you online. Hotel metasearch helps travelers compare hotel deals on various booking sites. When they select a deal, they’re redirected to the booking channel advertising that deal to make a reservation. Online travel agency (OTA) is a third-party booking site that offers travel-related products, as well as displays guest ratings and reviews. Booking channel refers to a distribution channel that enables travelers to make their room reservations. 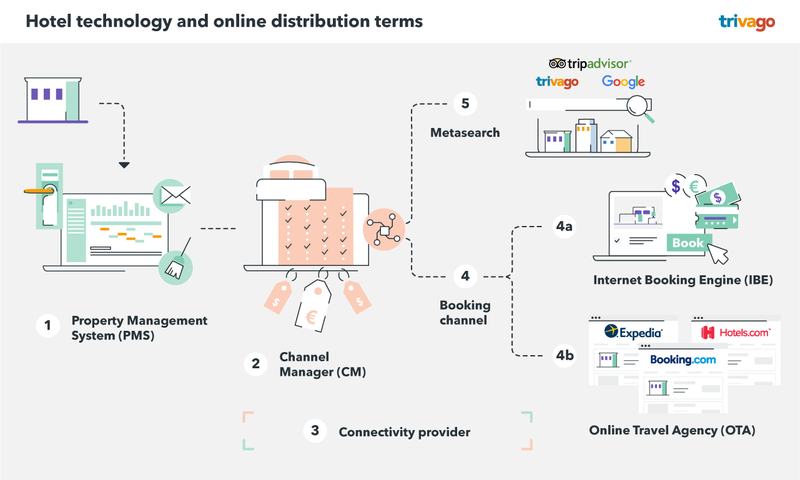 Connectivity provider provides software products (e.g., an IBE, and channel manager) to hoteliers. These types of companies also partner with hotel metasearch platforms like trivago, so that hoteliers can advertise their website rates directly to travelers. Internet booking engine (IBE) facilitates a traveler’s direct booking process on a hotel website and is available through a connectivity provider. You’ve got to get digital to get in front of your potential hotel guests. When advertising your hotel online, you’re going to want to know about the different available payment models and how you can track the success of your activities. Click-through rate (CTR) indicates the percentage of people who clicked on a link in an email or marketing campaign to reach a web page. It also reflects how effective the promoted content was by measuring the desired action taken (e.g. making a booking). Cost-per-acquisition (CPA) is a commission-based model OTAs use to charge for each booking a traveler makes. Cost-per-click (CPC) is a method used to charge for every traveler click on an advertisement. Cost-per-mille (CPM) is a pricing model used to charge for every 1,000 times an advertisement is displayed to travelers. Search engine results pages (SERPs) display the results of someone’s search query and sorts those by relevance. Search advertising (Paid search) is a model advertisers use to have their ads displayed when they match keywords entered in search engine queries. Search engine optimization (SEO) is an aspect of SEM without the paid advertising. SEO focuses on the managing of website content and links to the website in order to improve placement in search results organically. Have questions? Concerns? Article requests? Feel free to write to us in the comments section below! i love your side but have a question to ask, what do i do if my buseness name was used by a syber thief and i can not get in to Trivago? can i delite the side and start all over again ? she gets the bookings now and have the notifications with her.